14 dni je hitro naokrog in že je čas za nov izziv na Creative Moment Challenge. Kot vedno je tema Vse gre / Anything Goes. Eden izmed sponzorjev 106 izziva je tudi Polkadoodles. Sličica, ki sem jo uporabila je iz bogate zbirke digi štampiljk, ki jih Polkadoodles ponuja uporabnikom. Ker pa imamo v izzivu še več sponzorjev, vas vabim, da se nam pridružite in z malo sreče dobite lepo nagrado. Preslatka čestika i preslatka slikica, Jako mi se sviđa odabir boja, divne su! This is so beautiful, I love the image and your beautiful colouring. Thank you for sharing with us at the Ribbon Girl, good luck and I hope you will join us again. Thanks for joining in with our challenge at The Ribbon Girl! 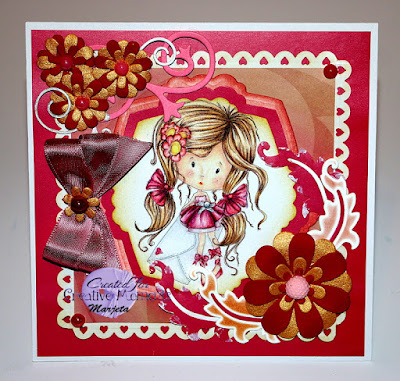 A beautiful card, such a pretty image and gorgeous colours. such a pretty card, thank you for sharing it with us at creative inspirations. Great creation, thanks for joining us at creative inspirations this fortnight. A beautiful card! Love the image and design! Thanks so much for sharing at Dis Digis!